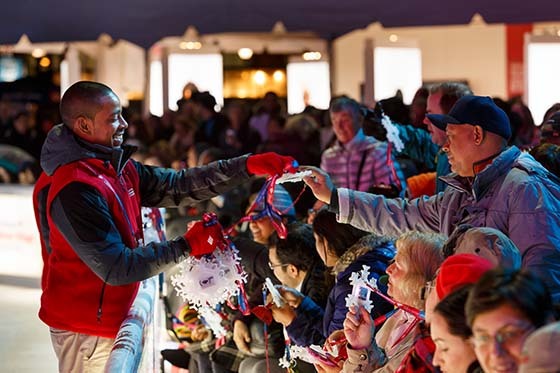 Our inaugural Tree Lighting Skate-tacular at Bank of America Winter Village brought wonder and holiday cheer to Bryant Park, taking us full speed into the holiday season. Even a little rain couldn't even dampen our holiday spirit. 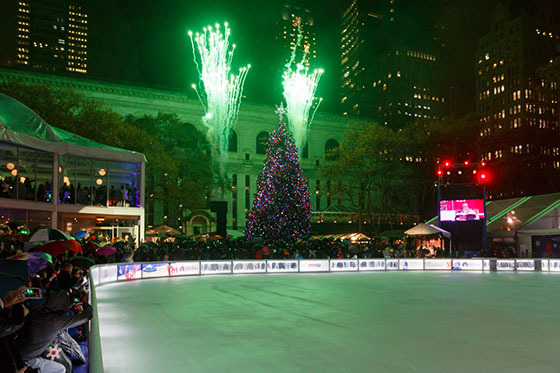 This year's Tree Lighting marked the beginning of a new Bryant Park tradition. 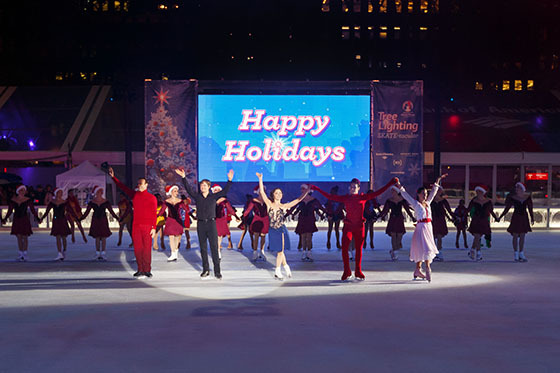 The Lights Before Christmas, an ambitious holiday show on ice, debuted on The Rink featuring a cast of world-renowned skaters. 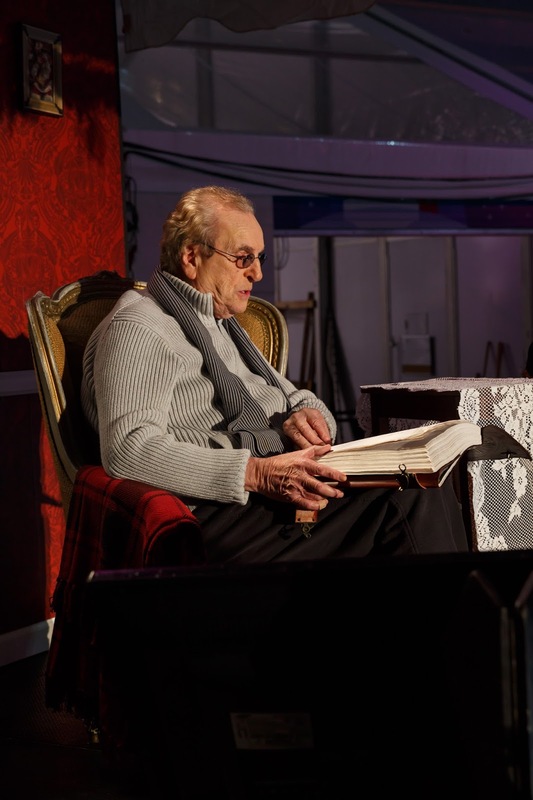 The show is the celebration of light personified into a cast of memorable characters. It is a story about giving what we can, no matter how small, and how we collectively shine brighter when we all allow our inner lights to shine. Below are a few photos of the different elements coming together to help make this a spectacular Skate-tacular. The audience helped ring in the lighting with interactive GlowMotion snowflake necklaces. Danny Aiello warmed the hearts of the audience with his soothing storytelling, narrating the story "The Lights Before Christmas." 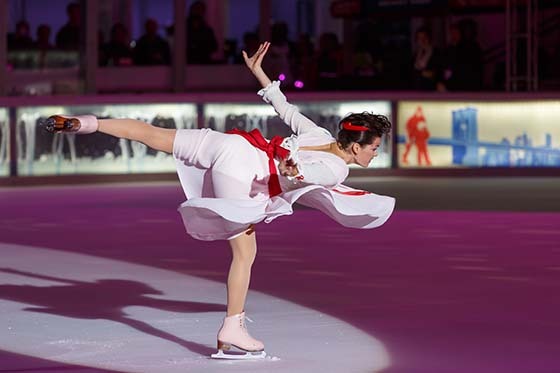 Nancy Kerrigan portrayed a sleepless girl eagerly awaiting Christmas morning as she skated along to "White Christmas." Johnny Weir stunned the crowd with a series of impressive spins as he played Santa, skating to "Have a Merry Christmas Baby." Davis and White performed to "Have Yourself a Merry Little Christmas", showcasing stunning aerials as they acted out the annual ballet between Christmas shoppers and taxi cab drivers maneuvering all around the city shopping for the Christmas Season. 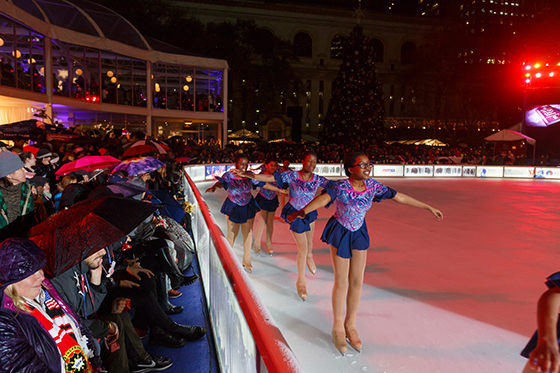 Bryant Park favorites,The Haydenettes, portrayed Christmas carolers with an intricate routine set to "The Christmas Song." 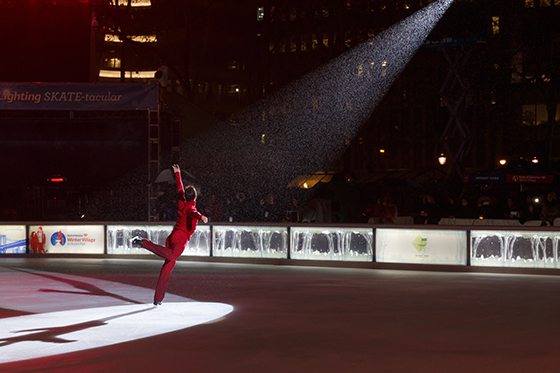 Brian Boitano performed as Mr.Christmas, skating a dazzling solo performance to "Silent Night." Figure Skating in Harlem helped distribute candy canes to the audience as they ruled the ice with a synchronized routine set to "Jingle Bells." 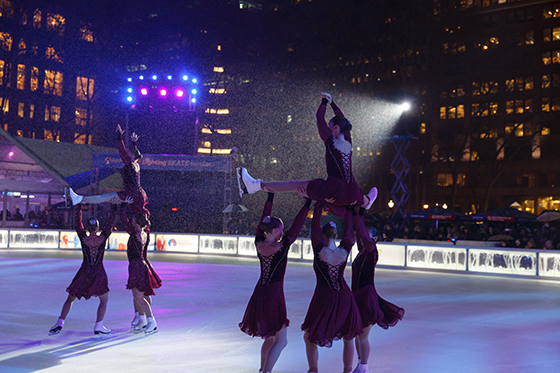 All of the skaters returned to the ice to help us light the tree. 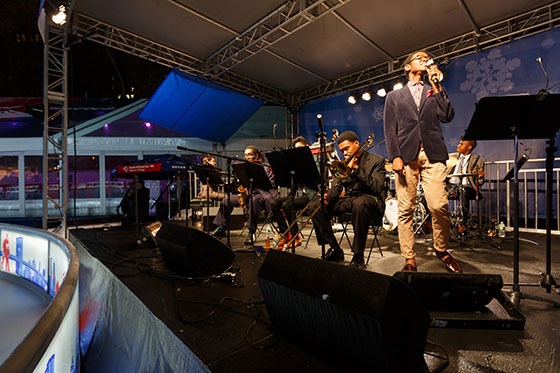 The Chris Pattishall All Star Ensemble played tunes curated by Jazz at Lincoln Center. Our 8,000 pound 55-foot Norway Spruce, decorated with over 3,000 ornaments and 30,000 lights. As this year's Tree Lighting Skate-tacular coincided with Giving Tuesday and World AIDS Day, Jeff Barker, the New York State President of Bank of America, announced that the bank would donate $.30 to (RED) for every purchase made at participating Winter Village merchants, spotlighting the impact of their efforts to eradicate AIDS. Now that the tree is lit you'll have until January 10 to view it in person! I love Johnny Weir! I wish I could have seen him in person! We're sorry you weren't able to join us for the Tree Lighting Skate-tacular. Johnny Weir was a highlight! The webcam has been encountering technical difficulties and we are doing our darndest to get it up and running again. We know that many people rely on the webcam so please do know it is a priority! Thank you for your patience.